Dhaka, Oct.16 (ANI): Kaberi Gayen, an academician at the University of Dhaka in Bangladesh has welcomed the ongoing war crimes trials in her country, and hopes the cases will be solved soon with a fair judgement. In an interview, Gayen lauded the government’s move to initiate war crimes trial and said that it started at the right time. “I appreciate the present government’s move that they started at last and somebody tells that after 40 years how it will be if the trial will be ok or something like that but I think, if we look at our past the we can say that this is the right time,’ said Gayen. Prime Minister Sheikh Hasina’s five-year term ends. She took charge of office in early 2009. Gayen said that any crime or criminal activity, if it is against humanity must be trial because the impact of it persists in the society and the country gets affected. The time frame is not important, what is important is that the criminals should be punished, she added. “No time is a very delayed time for bring to injustice if the crime is against humanity and if we look at wall history then we can say that even a few years back the second world war criminals were tried, so I think it is not only the right time but it was only time, it has been the only time when it could start so I welcome it,” said Gayen. She also appreciated India for providing data and documents to the international court. Bangladesh, formerly East Pakistan, gained independence with India’s help in December 1971, following a nine-month war against Pakistan. Around 3 million people were killed and thousands of women raped. The Islamist groups in Bangladesh want to scrap “secularism” as a state principle in the Muslim-majority country. The former chief of Jamaat-e-Islami party and country’s top Islamist leader, Golam Azam, was also sent to jail to await trial on charges of war crimes and abetting the Razakars who supported the tyranny of Pakistan Army on locals. The 90-year-old leader is facing trial for helping the Pakistani army during Bangladesh’s 1971 war of independence. Jamaat-e-Islami, opposed Bangladesh’s independence from Pakistan and fought with the Pakistani army in what was then East Pakistan, now Bangladesh. They were allegedly involved in war crimes and have thousands of militant followers, including in the defence forces, analysts say. Dozens of other Jamaat leaders including its chief Moulana Motiur Rahman Nizami and secretary-general Ali Ahsan Mohammad Mujahid are already in prison accused of war crimes. 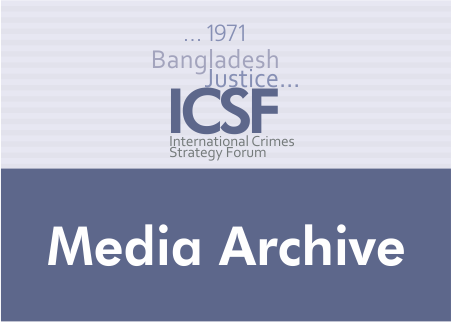 Official Bangladesh records show three million people were killed by the Pakistan army and their local collaborators during the nine-month war that ended in December 1971, heralding the birth of Bangladesh.